How to Speak Spanish Fluently: Stop Making These 5 Common Mistakes! As the Spanish say, “los idiomas se aprenden en la cuna o en la cama”—languages are learned in the crib or in the bed. But for those of us who aren’t lucky enough to have been raised bilingual from infancy or to have a significant other who speaks fluent Spanish, there’s still hope. I’ll admit it: I got lucky. I had my own personal, 6’4″ Spanish tutor my first year in Spain. But I also had a whole lot of personal motivation to learn, regardless of that relationship. If you’re already hitched, becoming close friends with a Spanish native can be (almost) just as helpful as finding yourself a dashing gentleman. Before arriving in Madrid to teach English with the North American Language Assistant Program, I wasn’t completely clueless about Spanish. I had studied Spanish throughout school and used helpful online resources in my free time. Just as important, I had a lot of motivation to learn. If you’re reading this right now I can bet that you also have the kind of personal motivation it takes to reach fluency. However, living in a Spanish-speaking country for an extended period of time is still a must in my opinion. The benefit of both hearing and speaking Spanish every day is invaluable to language learning. If you’re planning a trip to practice all the knowledge you have gained from FluentU, I’d definitely say Spain is a great destination. I’ll admit I’m a little biased. I arrived in Madrid from the U.S. thinking I would stay for nine months. Two years and one Spanish hubby later, I have no intention of returning anytime soon! However, if you have not yet gone abroad, don’t worry—you’re on the right track with FluentU. 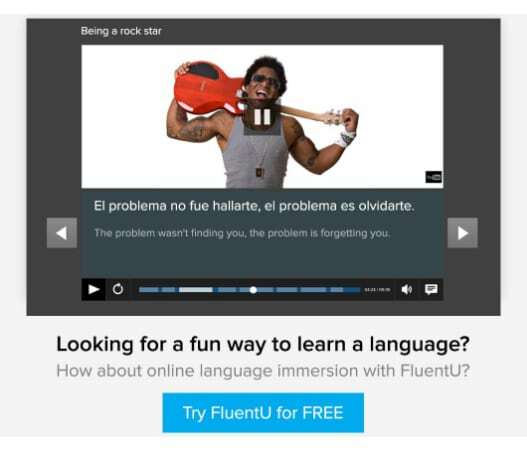 In the meantime, continue to immerse yourself in the Spanish language while at home like I did before making the jump. ¡Pero ojo! (But watch out!) If you plan on going abroad, you also need to plan on making the effort to meet native speakers rather than flocking to American groups. I could have easily avoided speaking Spanish for the entire year in Madrid, a big city with lots of international students and eager English learners. My boyfriend at the time (now my husband) also spoke English at an advanced level so I had to force myself to speak Spanish with him. My commitment paid off. At the end of that first year, I found myself thinking in Spanish and making jokes with his Spanish friends. Just like with any other valuable skill, however, I still had to make mistakes first. A lot of them. If you aren’t making any mistakes then you probably aren’t speaking in Spanish enough. If you make a fool of yourself—are red-faced and mortified and want to jump on the next flight home—at least you’ll never make that mistake again! In fact, I came to relish those moments because I knew that whatever word I just completely butchered would never be butchered again. Plus, you can usually get a laugh and a story out of these embarrassing moments which is great for small talk with your new Spanish-speaking friends. Not all mistakes are mortifying though. Some mistakes are small but, like a bad habit, you just can’t seem to shake them no matter how hard you try. Sometimes the same little mistakes will slip out over and over in conversation even though you know the correct way to say them in your head. Take a deep breath. This is normal. The important thing is that you’re communicating often, naturally and at a steady pace. This leads to fluency. A couple of months before the end of my first year in Spain (when I had almost achieved fluency) there was still some knowledge I had about Spanish that refused to perform for me when I needed it in conversation. Here’s a list of my most recurring mistakes at that time. Get this grammar solidified now and save yourself some pain later! The direct translation sounded quite strange to me in English and that’s why I wasn’t inclined to use it. However, when an action has happened quite recently (in this case on the same day) the Spanish use the present perfect and not the past simple. Past simple is used for things that happened farther back in the past. This is a nitpicky detail, but valuable to know if you want to sound fluent in Spain. This flexible word is very useful indeed. However, there are some occasions when you’ll need to swap it out for another word in order to sound fluent. Siempre cometo errores en español. Siempre hago errores en español. Since I knew that the Spanish verb hacer meant to do or to make, unfortunately it was my natural first choice in both of these cases. Thankfully the hacer versus tener sentido (makes sense vs. has sense) sunk in pretty fast and I never had a problem with this distinction, although it isn’t a direct translation from our English equivalent. It took me an embarrassingly long time living in Spain before I was aware of the difference between this verb and its reflexive variation, and once I knew it I still couldn’t get it to come out right half the time. Basically, quedarse means “to stay” and quedar has many meanings but is usually used when speaking of arranging to meet. Same case as before with the reflexive variation meaning “to leave.” Ir means “to go” (to a specific destination) and the reflexive me voy means “I’m leaving” (from this place). In the end, it’s all relative to your location. If you’re speaking of something you’ve brought to the place you’re currently located, then traer is the verb you’re looking for. If, however, you’re discussing taking something to a location other than the one you’re currently in, then llevar is the correct verb choice. So, in other words, if you’re home, you might talk of llevar something al colegio (to school) and traer something a casa (the place you’re currently located). The whole coming and going issue is tricky for many. Some would say that llevar is to ir as traer is to venir, which helps a little. You’ll really need to develop a gut sense for the direction in which you’re moving with your actions, and you’ll have to remember to switch up the words you use accordingly. This is by no means an extensive list of the many, many daily mistakes I still made after almost a year of living in Spain. I wasn’t even taught the imperfect subjunctive before coming to Spain so that was a big challenge for me as well in reaching fluency. On the bright side, I did reach fluency by the end of my first year, testing at a C1 level according to the Common European Framework of Reference for Languages. I also passed what I like to call the “party test” at the end of the year. What is the party test? Picture yourself at a Spanish bar late at night. The music is loud and pumping in your ears. There are several small groups of your Spanish friends conversing simultaneously, practically screaming over the music. You approach one of the groups and manage to jump into the conversation, actually understanding what’s going on and perhaps even contributing. Bam! You passed the test. I also mastered the alveolar trill or “rolling my r‘s” as well as the pronunciation of the Spanish j that year. While at first it felt awkward and forced to pronounce those letters in Castilian Spanish, by the end of the year it became second nature along with the Castilian lisp of c‘s and z‘s . If you have any experience with trying to learn Spanish, then you know that sometimes it feels like Spanish fluency is a carrot on a stick endeavor. It doesn’t help that every Spanish-speaking country sounds like it’s speaking a completely different language sometimes. When I first arrived in Spain I had to slowly trade vocabulary from my Mexican lexicon for words and phrases particular to Spain which wasn’t always easy. But don’t fret! In the end, you’ll be understood if you have mastered the basics and will come to find that the richness of the Spanish language is something to get excited about. At the beginning of my year abroad I would have never guessed that my carrot on a stick was in reach, but that first sweet bite of fluency recognition is a lot closer than you think. 20 Animal Sounds in Spanish: Can You Bray, Squawk and Meow en Español?